This is the Gray Francolin (Francolinus pondicerianus), a partridge-like ground bird that is very common in open grassy and shrubby areas on our island. In fact, they are frequently seen on golf courses. They are sometimes referred to locally as 'Kohala Chickens' because there are so many of them in our district. These birds are not native to Hawaii, but they have flourished here for a long time. They were introduced as a game bird more than a century ago, and they are still hunted (but not by us). The natural provenance of the species is India. The male and female are virtually identical, except that the male has leg spurs. They stand about a foot tall. Gray Francolins are daily visitors to our back garden. They are creatures of habit. We can practically set our watches by their appearance at our ground feeder each morning. We have fed and watched many generations of these birds. 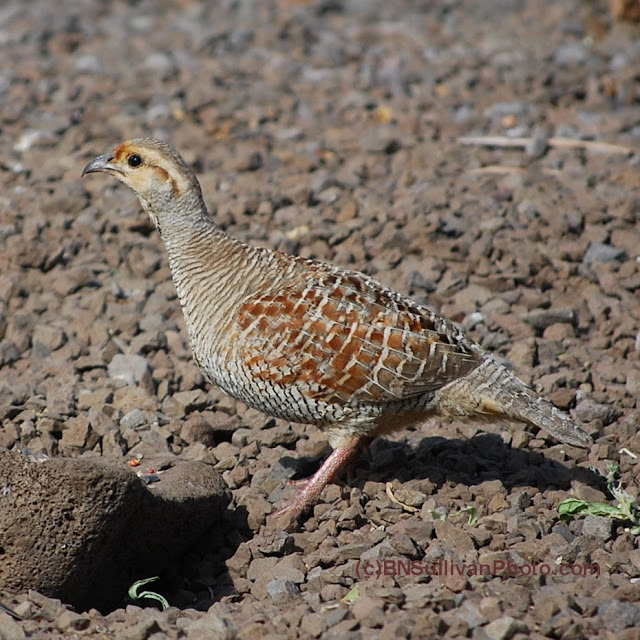 I was looking for a snap of the bird that has been coming to my feeder in Hilo and found your francolin. I think my visitor is an Erkel's, though. I am enjoying touring your blog and your photos are grand. we share the common interests of Hawaii, cats, birds, and nature, in general. Mahalo for posting your nice work! I have only seen a few Erkel's Francolins -- all at higher altitudes, such as near Waiki'i on the Saddle Road. The Grey Francolins are by far the most plentiful in our area, but we also see Black Francolins from time to time. The female Black Francolin looks very much like the Grey Francolin, but the male looks almost like a pheasant with a short tail, at first glance. The Greys always travel around in packs (flocks? ), while the Erkels and Black Francolins appear as singles or pairs. We like all of them!